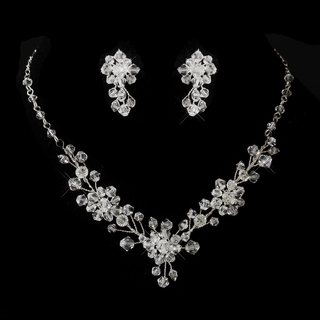 Intricate clusters of genuine Swarovski crystals create the unforgettable look of this gorgeous, hand-crafted jewelry set. Its V-shaped design adds elegance to the neckline while its sparkling crystals are sure to compliment any wedding dress or formal gown! Size: The necklace measures 15-1/2" long x 1/8" wide, with a 2-1/2" central drop. The earrings measure 1" long x 5/8" wide.